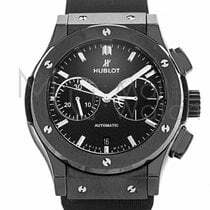 It's all about black in the Black Magic models from the luxury watch manufacturer Hublot. They can be found it every collection and set themselves apart with their black cases, bands, and dials. Bright hands and indices make for a nice contrast. The Swiss manufacturer Hublot is known for their distinctive porthole design with a wide, screw-down bezel. The Black Magic is no exception. While not a collection itself, the Black Magic is a style found in several Hublot collections. As the name suggests, these watches all come in a deep black color. This is true of the cases, dials, and bands. Only the hands, indices, H-screws on the bezel, and crown are in a metallic silver that contrasts nicely with this otherwise black timepiece. Hublot remains true to their fusion concept with the Black Magic. Like the first Hublot watches from the 1980s, the straps are made of natural rubber – though this time they are paired with ceramic cases. How much does a Black Magic cost? The Big Bang collection is Hublot's flagship series. This imposing, slightly angular watch first appeared in 2005 and immediately went on to win numerous awards. The collection includes multiple sub-series, each of which contains a Black Magic model. 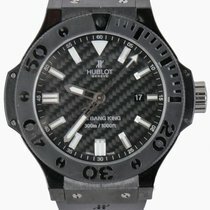 In terms of price, the Big Bang King serves as the entry point into the world of black Hublot watches. This watch is water resistant to 300 m (30 bar, 984 ft) and costs about 10,500 USD new. You'll need another 1,200 USD to purchase a black Big Bang 44 powered by the Valjoux 7750 chronograph movement. If having an in-house caliber is important to you, watches in the Unico and Meca lines are right for you. The latter uses the manually-wound caliber HUB1201, which provides the Meca with its ten-day power reserve. Such pieces demand around 17,600 USD. Unico models all feature the in-house caliber HUB1240 with a modular design, allowing for a wide variety of complications. For example, you can get a Unico Black Magic 45 with a flyback chronograph for about 16,400 USD. Models with a perpetual calendar cost around 46,800 USD. The Classic Fusion is a more conservative timepiece than the Big Bang and also has a Black Magic version. It's available in sizes ranging from 33 mm to 45 mm, suitable for both men and women. Plan to spend around 8,100 USD for a model on a rubber strap. Those on a ceramic bracelet cost almost 10,000 USD. The addition of diamonds to the bezel bumps the price to about 11,000 USD. The Classic Fusion Black Magic is either 42 or 45 mm in diameter and is available with the chronograph caliber HUB1143 based on the ETA 2892-2. This version goes for around 9,400 USD. The Aerofusion also belongs to the Classic Fusion collection. The dial is skeletonized , and the visible graphite gray and black movement parts fit well with the style of the Black Magic line. The Aerofusion is available with complications such as a chronograph or moon phase display. Be sure to set aside approximately 12,900 USD for one of these 45-mm timepieces. With a 48-mm case, the King Power is one of Hublot's largest men's watches. The Black Magic version of the King Power is available with a rather rare complication at 9 o'clock: a subdial with a hand that makes a complete rotation every second. Known as a foudroyante, this complication makes it possible to measure times to within an eighth of a second. The ETA-7750-based caliber HUB4144 also provides the timepiece with its split-seconds chronograph, which can be used to take intervals. Expect to pay about 19,900 USD for a new King Power Black Magic Foudroyante. If you decide on a King Power Unico Black Magic, you can save around 2,300 USD. This version is outfitted with the in-house caliber HUB1242 without a jumping seconds mechanism. The Spirit of Big Bang catches your attention with its tonneau (barrel-shaped) case. Hublot has been producing this watch since 2014 and gave it its own collection. The manufacturer also offers a Black Magic version with a skeletonized dial and a chronograph movement based on the famous Zenith El Primero caliber. These timepieces sell for a solid 19,900 USD. 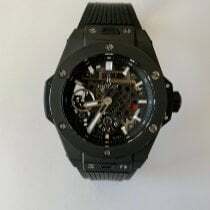 However, the Black Magic line should not be mistaken for Hublot's All Black watches. All Black models have had a greater influence on the image of this Genevan manufacturer, as they use the color black much more consistently. These watches feature black indices and hands in addition to their black cases, bands, and dials. All Black models can be found throughout the Hublot catalog. Their prices range from 5,800 USD for a quartz-powered Classic Fusion to over 234,000 USD for a solid black version of the MP-05 LaFerrari.